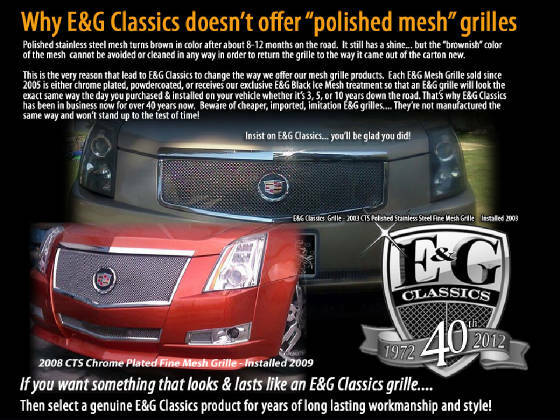 Chicago Wholesale / Marcson co.
"ABOUT US" / "CONTACT US" /"CONDITION OF USE"
Our "New Vision Styling" allows us to bring to the market some of the most highly sought after products such as "E&G Classic Grilles" and Accessories. We specialize in custom grilles for all makes of cars from import to domestic. Vintage, Truck and SUV's and passenger cars like the Chrysler 300C, Dodge Charger and the new 2015i Cadillac Escalade. Our selection does not stop there. We carry a large selection of stainless steel accent trim. Items like door handles, mirror covers, tail light trim, rocker panels, pillar post trim and much more. We are always expanding our selection and looking for new items to offer. Take a look inside. If you don't see what you are looking for, just give us a call and we will see if we can find it for you! Contact us for details on pricing and availability. We are a wholesale distributor. "Sorry" but we do not sell wholesale to the public over the internet. Pricing is for qualified wholesale accounts only. To get information on setting up a wholesale account, contact us and we will send you the required paperwork. TFP Trim, Putco, QAA Trim,…ETC! Click Image to Read Why! "ABOUT US" / "CONTACT US" / CONDITION OF USE"